1. Launched this week: PUNCH, an online magazine dedicated solely to wine, spirits, and cocktails. I was lucky enough to learn of PUNCH first-hand during the cocktail hour before an Outstanding in the Field dinner. They were serving up a gin punch (pictured above) using all locally sourced ingredients, with fresh nutmeg grated into each individual drink. For 150+ guests. I worshipped them instantly. 2. Did anyone else wake up this morning to find that the outside world has decided it's already Christmas? My initial annoyance was quelled by the arrival of Kate Spade's Holiday Gift Guide, with all its glittery fonts and bright colors - especially when I discovered a section titled "Merry Essentials for a Champagne Cocktail Soirée." Yes, please! You have to admit, this champagne label iPhone case is pretty darling, if entirely unnecessary to said soirée. 3. Martha Stewart: American Made is a collection of carefully selected "Tastemakers" who produce handmade products. I attended the two-day marketplace at Grand Central to see them in person, and they really are making some beautiful things. Maybe we should all make a pact to give only artisanal gifts this holiday season? Luckily you can shop the collection online at the American Made Market on Ebay. I really think this Pie Box would help you make a gracious entrance to a Thanksgiving celebration. 4. Clementine Daily launched in September and I'm now fully caught up on their amazing content. I especially love that they have a category called "Low Key Entertaining" - I will definitely be checking in often. Through Clementine Daily I discovered Mouth, a great online source for food gifts. 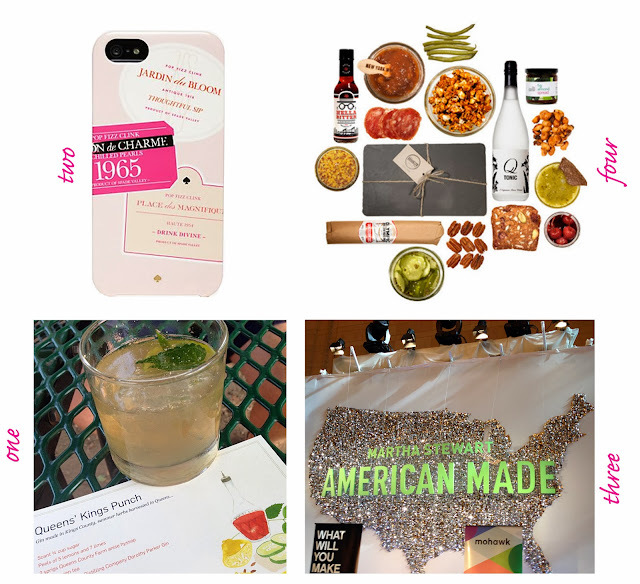 With their "Cocktail Hour Every Month" subscription you can send someone a monthly box of cocktail party prep (one shipment pictured above). Giving the gift of celebration - how fabulous. 5. Perhaps the biggest story of the week involves news of the global wine shortage. Tragedy. 6. Speaking of tragic, we didn't get ONE single trick or treater last night. My carefully laid plan for no leftover candy failed. Enter this Serious Eats guide from last year about churning leftover Halloween candy into ice cream. I'm pretty sure incorporating more calories means my plan not only failed, but backfired...but that probably won't seem so terrible when I'm eating Kit Kat ice cream. Hi Monica: We had an onslaught of trick or treaters so no leftover candy for me, but I love the ice cream idea. I did hear of the wine shortage though - ugh... See you in class. Cyndi I'm jealous you got rid of all your candy - I had to wrestle mini Snickers away from my husband today because he's ODing on sugar!